Our meal plans are available in four sizes to fit a variety of eating habits and tastes. Students who live on campus must purchase a plan each semester. Meal plans pre-pay for full meals you can eat in the Student Dining Room or certain menu items from the Cafe 1843. They also include varying amounts of funds you can use to treat guests to a meal or buy groceries. This plan is for students who want the most for their money, and is enough to cover all meals that are served in the dining room. This meal plan works around your schedule, in case you eat outside of normal meal hours for the dining room. See below for details on how flex plans work. This plan is for light eaters and those who often eat out or cook on their own. See below for details on how flex plans work. Available for apartment residents only. What's a Clarke ID Card? All of your funds, all in one place. You can use funds for any food purchases, including snacks and drinks from the Cafe 1843 or campus store (sorry, you can’t use them on convenience store items that aren’t food). You can also use them in the dining room to treat guests to a meal. They’re stored on your Clarke Card, just swipe to use them. No refunds are available for unused funds. But any balance you have will roll over to the next semester — except at the end of the school year, when anything unused will be lost. Miss a meal? No problem; exchange it. Our student dining room is open for most meals, but you can’t always make it during meal time. If you miss a meal, all traditional board plans include a meal exchange. Use your Clarke Card in the Cafe 1843 to receive a value meal for lunch or dinner. Need your meal to go? Or a sick tray? We Can Help. If you’re sick or have to miss meal periods for other commitments, you can request a carry-out meal from the Student Dining Room. Just present your Clarke Card to pick it up. Can I change my meal plan? Sure thing. You can change your plan until two weeks after the start of each semester by logging into your Clarke Card account. A sustainable approach to food is important to me. I try to purchase from as many local food vendors and sources as fiscally possible. Do you have a favorite recipe from home? We can make it. If you’re homesick for one of your favorite foods or have an idea for a recipe that would be great in the dining room, let us know! 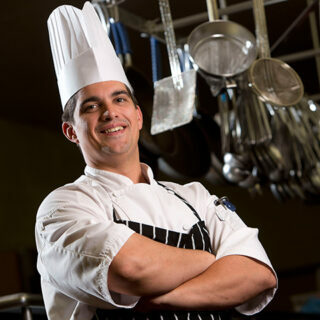 Our chefs will work their magic to make sure your dining experience is delicious.